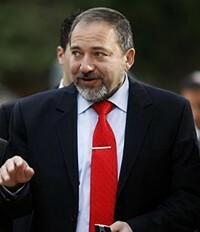 Avigdor Lieberman became foreign minister of Israel yesterday. He celebrated his inauguration with a maiden speech that news reports indicate left his listeners grimacing, squirming, and aghast. The BBC, for example, informs us that his words prompted "his predecessor Tzipi Livni to interrupt and diplomats to shift uncomfortably." The world order: The Westphalia order of states is dead, replaced by a modern system that includes states, semi-states, and irrational international players (e.g., Al-Qaeda, perhaps Iran). World priorities: These must change. The free world must focus on defeating the countries, forces, and extremist entities "that are trying to violate it." The real problems are coming from "the direction of Pakistan, Afghanistan, Iran and Iraq" – and not the Israeli-Palestinian conflict. Egypt: Lieberman praises Cairo as "a stabilizing factor in the regional system and perhaps even beyond that" but puts the Mubarak government on notice that he will only go there if his counterpart comes to Jerusalem. Repeating the word "peace": Lieberman poured scorn on prior Israeli governments: "The fact that we say the word 'peace' twenty times a day will not bring peace any closer." The burden of peace: "I have seen all the proposals made so generously by Ehud Olmert, but I have not seen any result." Now, things have changed: "the other side also bears responsibility" for peace and must ante up. The Road Map: The speech's most surprising piece of news is Lieberman's focus on and endorsement of the Road Map, a 2003 diplomatic initiative he voted against at the time but which is, as he puts it, "the only document approved by the cabinet and by the Security Council." He calls it "a binding resolution" that the new government must implement. In contrast, he specifically notes that the government is not bound by the Annapolis accord of 2007 ("Neither the cabinet nor the Knesset ever ratified it"). I will never agree to our waiving all the clauses - I believe there are 48 of them - and going directly to the last clause, negotiations on a permanent settlement. No. These concessions do not achieve anything. We will adhere to it to the letter, exactly as written. Clauses one, two, three, four - dismantling terrorist organizations, establishing an effective government, making a profound constitutional change in the Palestinian Authority. We will proceed exactly according to the clauses. We are also obligated to implement what is required of us in each clause, but so is the other side. They must implement the document in full. We are also losing ground every day in public opinion. Does anyone think that concessions, and constantly saying "I am prepared to concede," and using the word "peace" will lead to anything? No, that will just invite pressure, and more and more wars. Si vis pacem, para bellum - if you want peace, prepare for war, be strong. Israeli strength: Lieberman concludes with a rousing call to fortitude: "When was Israel at its strongest in terms of public opinion around the world? After the victory of the Six Day War, not after all the concessions in Oslo Accords I, II, III and IV." (1) I have had reservations about Lieberman and still do, but this speech has him off to a great start. Put as briefly as possible, he announced that "Israel is back." (2) Given that the formal name of the Road Map is "A Performance-Based Roadmap to a Permanent Two-State Solution to the Israeli-Palestinian Conflict," I confess myself puzzled by the news reports (such as the one headlined in the Los Angeles Times, "Foreign minister says Israel not bound to follow two-state path") declaring that Lieberman has pronounced the end of the two-state solution. (3) There is much irony in Lieberman now championing the Road Map, an initiative he and many others of his outlook condemned at the time. For an authoritative discussion at the time of its origins, flaws, and implications, see the analysis by Daniel Mandel, "Four-Part Disharmony: The Quartet Maps Peace." Oct. 7, 2009 update: I keep an eye on later developments in a weblog entry, "Avigdor Lieberman as Israel's Foreign Minister."